Jus Rol Ready To Bake pastry makes it easy to bake croissants, cinnamon swirls and pains au chocolat. Jus Rol Ready to bake pastry is freshly baked in minutes. So easy to bake a pastry, croissant, cinammon swirl or pain au chocolat for breakfast or as a snack. Keep refrigerated below 5°C. When opened use immediately. Do not freeze. Remove the product from the fridge at least 15 minutes before preparation. Preheat the oven at 200°C (180°C for fan assisted ovens / Gas Mark 6). 1. Put some flour on your hands and on the work surface. Open the bag and take out the dough. 2. Using your finger tips, press the dough in the center and push outwards to form the edges. Don't use a rolling pin, as this will damage the dough. 3. Pick up the dough by holding one edge in each hand and allow it to hang vertically, the weight of the dough will make it stretch and become thinner. 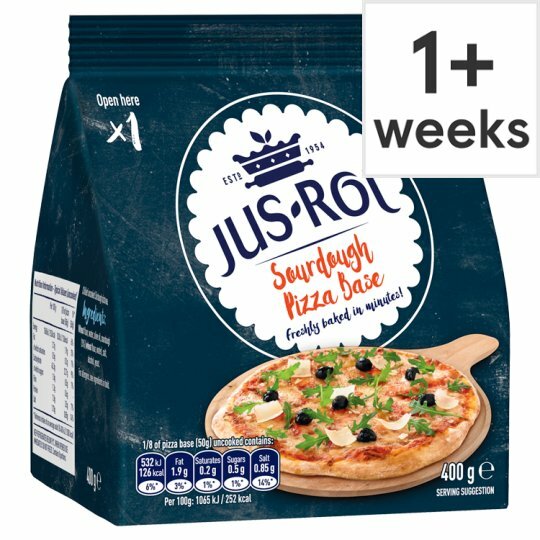 Rotate your hands around the edges, allowing the dough to stretch each time, until you have achieved the desired thickness for your pizza base (approx. 30 cm in diameter). 4. Place the pizza base on a baking tray lined with non-stick baking paper and cover with the ingredients of your choice. 5. Bake the pizza for 20-25 minutes (or until the edges are golden brown and toppings are fully cooked). At Jus-Rol™ we love pastry and we hope you do too. To get in touch you can phone or contact us via our website.